Us teachers are often subject to criticism. As a result we can be very defensive. We have an important job to do under difficult conditions so it's no surprise that we're sensitive when told that the quality of our teaching could be improved. Unfortunately this defensiveness makes us resistant to new teaching ideas, and that is a tragedy. Because new teaching ideas keep this profession moving forward. New approaches to explaining mathematical concepts have the potential to transform maths education. It is absolutely essential that we are open to these ideas. We've heard a lot of rhetoric from the Department for Education about Shanghai. It's easy for us to get frustrated about the comparisons because there are significant differences between our nations, both in terms of culture and the underlying structures of the teaching profession. But let's put the politics to one side - the questions maths teachers should be asking are, "How can I find out what happens in maths lessons in Shanghai, and will those ideas be useful in my classroom?". 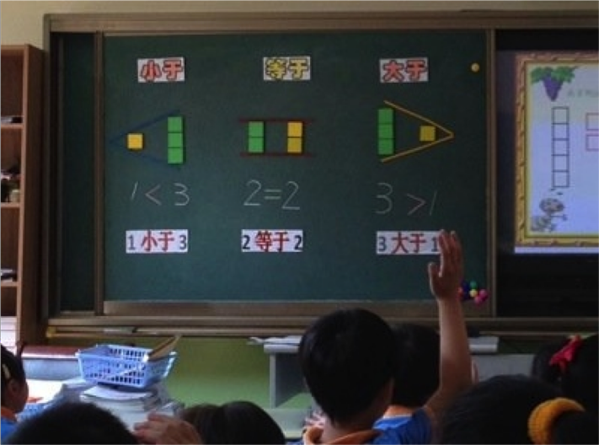 Well I have some answers for you - you can find out about what works well in Shanghai through the Maths Hub initiative and yes, some of the ideas are fantastic and easy to apply. Don't be too quick to dismiss them. 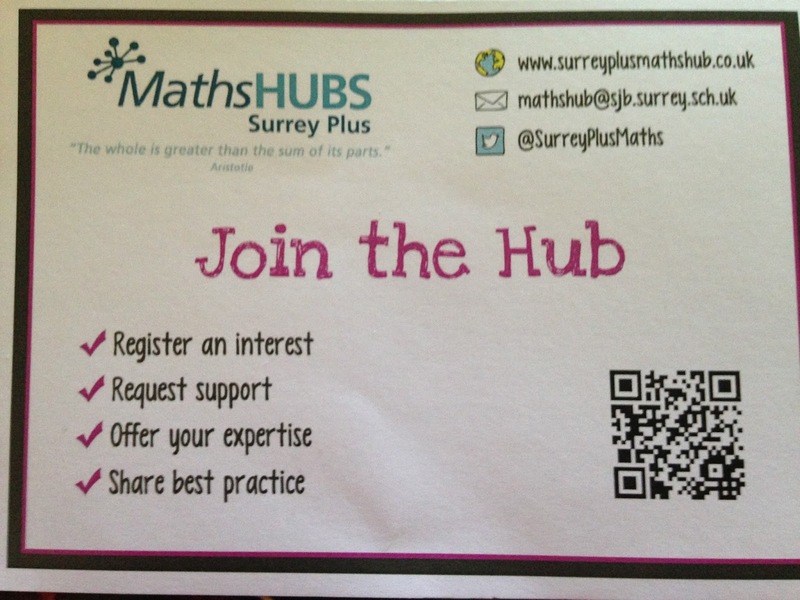 Today I went to the launch of the Surrey Plus Maths Hub. The lead school is St John the Baptist School in Woking - their teachers have recently returned from a trip to Shanghai so I knew we'd hear all about it at the launch. I felt defensive, and I admit that I arrived with an arrogant 'I have nothing to learn from them' attitude. I was pleasantly surprised - the speakers (who delivered excellent presentations) were careful not to alienate their audience. They acknowledged the huge cultural and family differences between China and the UK. They also acknowledged the fact that teachers in Shanghai have numerous advantages over us, the most notable being that they only teach two 35 minute lessons a day (they spend the rest of their time doing research, marking, planning and collaborating with colleagues). The speakers acknowledged all these differences but did not focus on them, because these things are beyond our control. Instead, they focussed on interesting mathematical methods that we can all start using straight away in our classrooms. In this post I'm going to share these methods because, although some may seem 'obvious', sometimes we overcomplicate things. I think these simple methods are actually rather useful. The two questions above were given to us as a starter at the hub launch. What great questions they are. These are given to 10 year olds in Shanghai and they can work out the answers in their heads. I'm impressed. Well done Shanghai. Work out 2.5 x 3.2 in your head. Quickly! 2.5 x (4 x 0.8) = 10 x 0.8 = 8. I don't think my students, even my sixth formers, would think like that. Either way, a bit of clever number manipulation makes this question fairly straightforward. = 1000 x 10.1 = 10,100. See how this works? If we have a 12.5, we look for an 8. If we have a 25, we look for a 4. We manipulate the numbers to make the calculation fit what we know. So let's use these ideas to answer those starter questions. I'll leave you to work out a good strategy for answering the second question yourself (tweet me your answer or comment below). So, why not start teaching your students these clever mental strategies? It's never too late to develop number skills. These lessons would work at any age. I could do with practising these strategies myself. 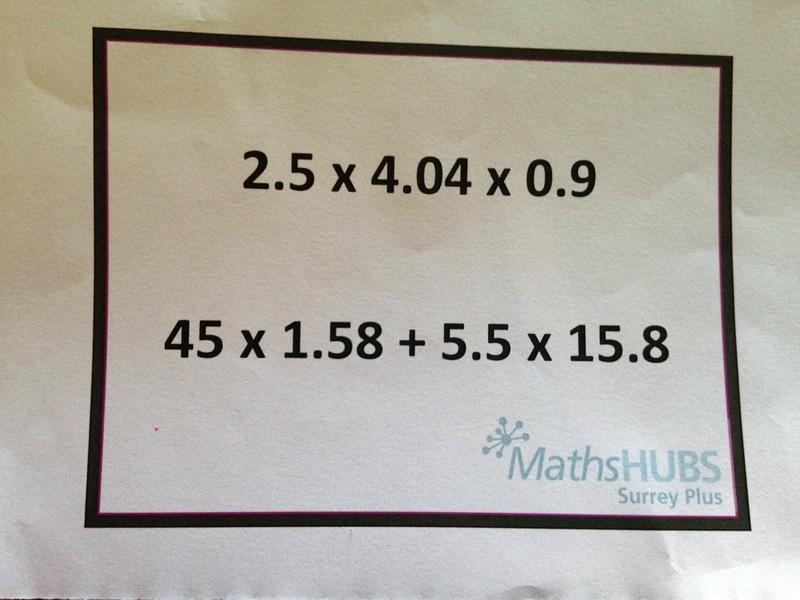 In response to the the multiplication strategies above, ‏@MathsSfL pointed out that numbers could also split up, for example if a student is struggling with the 6 times table then they could multiply by 3, then by 2 (eg 7 x 6 = 7 x 3 x 2). 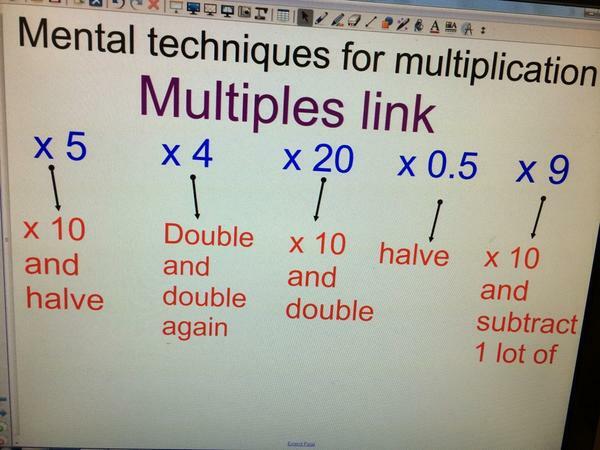 ‏@mathsdotcom added that this works well for the 8 times table - there's no need to learn it - just multiply by 4 then double it. Another thing that was mentioned at the hub launch was 'smallest number first'. If a child is asked to work out 7 x 4 then they could think of it as 4 x 7 - so no need to use the 7 times table. 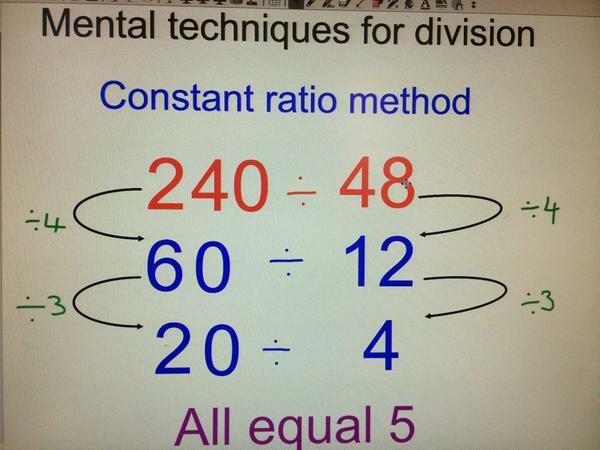 Thinking like this cuts down on lots of duplication in memorising times tables. So a large chunk of our usual times tables chart is unnecessary - remove the duplication and we are left with the chart below. 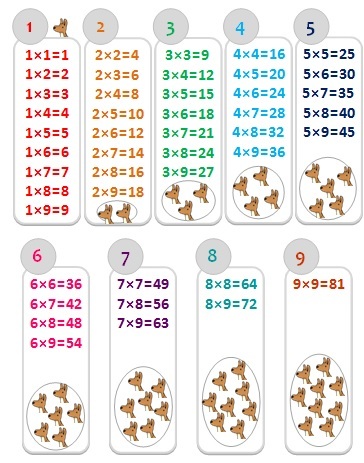 Kangaroo Maths also very helpfully gives us the 21 times table facts that students need to learn. In my post Shortcuts vs Concept Development I admitted that I refer to crocodiles when introducing the inequality symbols (ie crocodiles eat the bigger number). I decided I'd continue to do this until I found a better way to help students remember which sign is which. Well, today I found a replacement for crocodiles. It's so simple, it's silly. All students need to do is visualise numbers as blocks - the wider end of the inequality symbol fits over the bigger stack of blocks. So if x > 2, we know x must be a number bigger than 2. Eventually they'll start automatically reading the symbol > as 'greater than' without having to visualise the blocks. Simples. Pencils come in packs of 10. I have 4 full packs and 7 extra pencils. How many pencils do I have? 1. I have 4 packs of 10 pencils plus 7 extra so I do: 4 x 10 + 7 = 47. 3. I have 7 pencils plus 4 packs of 10, so I do: 7 + 4 x 10 = 47. In the final example, the child doesn't try to add the 7 and the 4 before multiplying by 10 because it doesn't make sense to do so. The context of the question helps them understand this. Some people are critical of the Maths Hubs initiative but I felt it was important to attend the launch. I don't want to stubbornly resist learning from Shanghai without at least taking the time to find out about their methods. The ideas I've written about here aren't groundbreaking, but they got me thinking about the way I explain things. It took me almost two hours (in terrible traffic) to get to the launch event so, as a busy teacher with a young family, I doubt I'll be able to attend any more hub events on school days, which is a shame because they have some great stuff planned. A lot of their work will initially focus on subject knowledge enhancement (ie helping non-specialist teachers with their maths), which is definitely worthwhile. They may not be reaching everyone who needs help yet but there were over 100 people at the launch event, which is a good start. It's a shame that the hubs' funding might be stopped on the whim of a politician because it makes it hard for them to plan over the long-term. But for now, if they're bringing fresh ideas into classrooms, offering support where it's needed and providing opportunities to collaborate, that's fantastic. 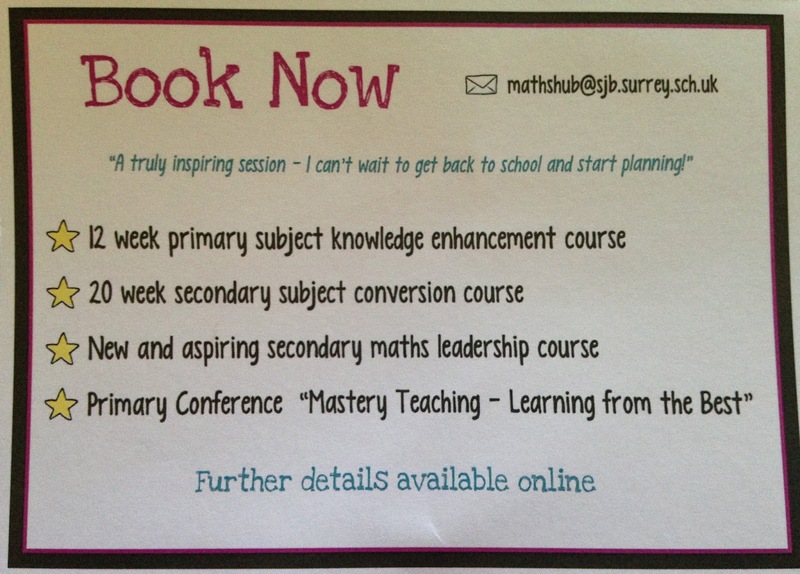 Do get in touch with your local hub through www.mathshubs.org.uk to find out what's going on. Just be prepared to hear a lot about Shanghai - but maybe that's not such a bad thing after all. Thanks for sharing this. To me, good number sense involves the ability to decompose and recompose numbers (and not to blindly follow some algorithm) so you've given me some new ideas that I can share with my colleagues here in Ontario. I like the fact that you pointed out that the presenters did recognize that there are some differences between our systems and Shaghai's that we can't do anything about but that doesn't stop us using their math ideas. Chock full of great stuff - thank you! The more number work I do in classrooms, the more useful I find this sort of multiplicative 'trickery'. The other day my A-level class asked if I'd planned a particular answer (they didn't believe it was possible to work it out in your head without previously memorizing it!) If only I had time to plan that thoroughly!! I like to use prime factors a lot, too. If you can visualise 24 x 45 in terms of 2s, 3s and 5s you can just rearrange all the factors to make things easy: (12) x 2 x 5 x 3 = (12x3)x10. PS - have voted for your blog! I didn't learn any clever mental methods at school and I often find that my students do mental maths quicker than me. They do great stuff with number bonds at primary school these days. I love your prime way of thinking. Breaking numbers down to make them easier to work with is a very clever strategy. My Year 12s take too long to work out 3^4 - they never spot that they could think of it as 3^2 x 3^2, which is so simple. Thanks for your comment. I'm glad you like the post. International differences are really interesting. In the UK we don't do much on mental strategies, which is a shame. We're too busy trying to teach far too many topics in our very broad curriculum. Have you seen any of the 'how did they do that' you tube countdown videos? they usually rely on taking out 25's ie 100 = 4x25, 75=3x25 etc and working with the smaller numbers up to the final result. I have always worked to the maxim that 'the laziest way is the best way' but some children just hate short cuts - they don't even like rounding £x.99 prices! I must use the @learning maths ones - surely no one will object to the obvious short cuts there! Thanks for your comment. I haven't seen those videos so will check them out now. I agree, there's a time and place for shortcuts - I don't see the point in overcomplicating things, as long as students understand why the methods work. Just spent ages trying to do this calculation quickly. Omg it's so obvious now you've shown me! Thank you! Great stuff. New challenge for me: practise lots of mental maths methods and get really good at Countdown.